I sometimes get very attached to material objects. Usually these objects have some type of personal meaning to me, if that makes it any better. 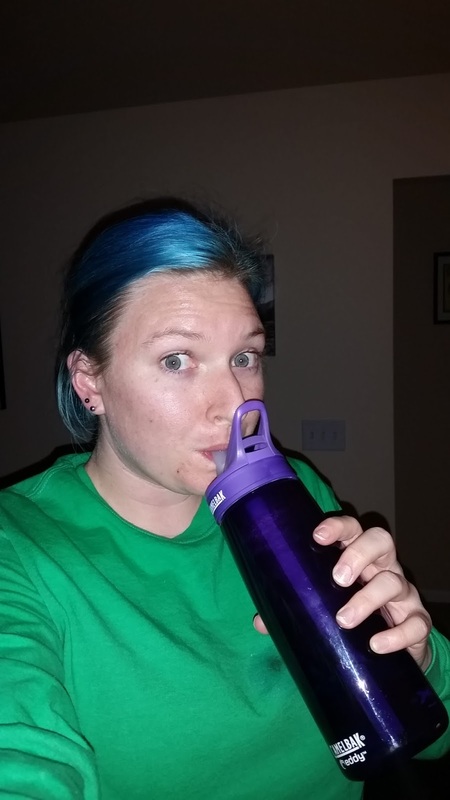 This post is about my blue Camelbak water bottle which was my super devoted water bottle. Teh Worldwide Jesus Lover gave it to me as a birthday present in 2006? idk, it was a super long time ago. I asked for a water bottle with a straw and she found this one and it was the ONLY water bottle I used for the longest time. I only ever put water in it. 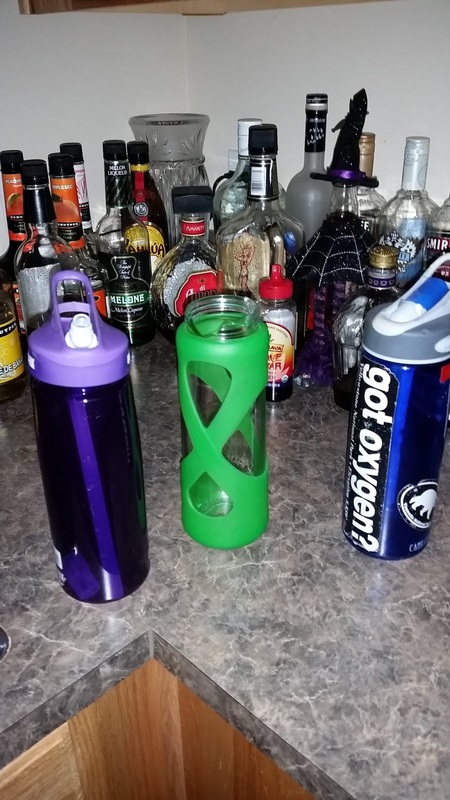 I had a Nalgene bottle as my adult beverage bottle, but I NEVER used my Camelbak for anything but water. It was the RULES. Let's pretend it was the bottle to my left, not the shot in my hand that was making me grin with such intensity, mmkay thanks. When I drove across the country with Teh Granny and we visited Yellowstone, I accidentally left my water bottle in the van. I was afraid that it was gone for good, but when the van came to the resort to pick up people the next morning, they dropped it off for me. That's when I knew it was fate that this was my Camelbak. We were together forever. My Camelbak traveled to GTMO and Bahrain and Australia and Scotland and people always knew which one was mine. It had stickers from all the national parks I've visited. For the longest time, it had a Peace Frog on it, but it eventually peeled off after being put in the dishwasher too much. At one point in 2013, I dropped it and the top suction thingy ended up breaking, but I was able to steal Teh Bear's lid from his Camelbak since he'd upgraded to a bigger one. 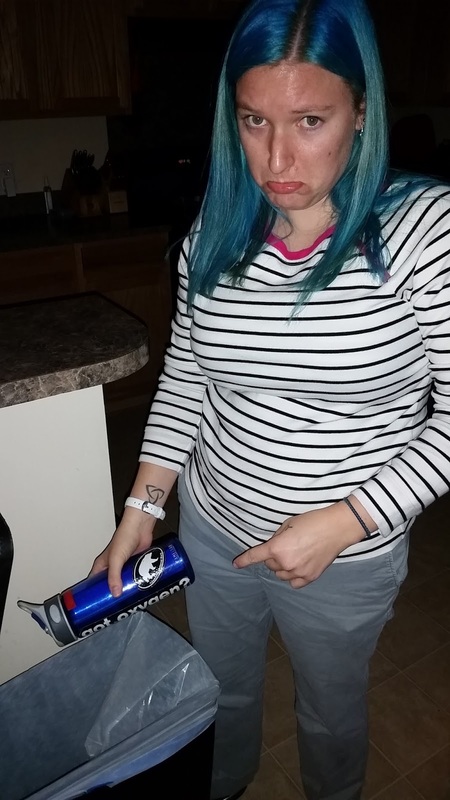 Then, on one of my last days in Pax River, after a color run with Teh MD Roomies, I got out of Yurtle and my Camelbak dropped out of my hand and hit the pavement. This was not an unusual occurrence. The Camelbak had taken a lot of abuse over the years. Drops, tosses, rolls. More abuse than any of my other belongings. But it always took it like a man. We were always able to move on from my abuse problems. I picked up my Camelbak and brought it inside and set it on the counter. I came back a few minutes later to see a puddle on the counter. I thought maybe my bottle was sweating, but that didn't seem to be the case. Very confused, I wiped off my bottle and held it over the sink. The continuous drip, drip, drip didn't stop after I wiped off the bottle again. There might have been tears formed in my eyes when I noticed the hairline crack in my bottle. My Camelbak and I had so many good times. Dates with friends, road trips, hikes, travel. It was with a heavy heart that had to replace it. I upgraded to the Camelbak glass bottle. Not for any particular reason other than it seemed cool at the time. I should have known it wasn't meant to be when I ordered it and instead of it shipping to SC, where I was going to be by the delivery date, it went to MD. Teh MD Adult Roomie had to ship it to me, but since we went on the cruise after my SC arrival, I wasn't even home to receive it. Then, once we got home and I started using the glass Camelbak, I realized it didn't fit very well in Yurtle's cup holders, which fit an extra large McDonald's sweet tea with 0 problems (this is also why I wasn't interested in upgrading to a new bottle when my lid broke since I knew that most of the bottles were bigger then, and I didn't want a bigger bottle since it wouldn't fit in the cup holder). It usually stayed in the cup holder, but it was sticking up too far and was always in the way. 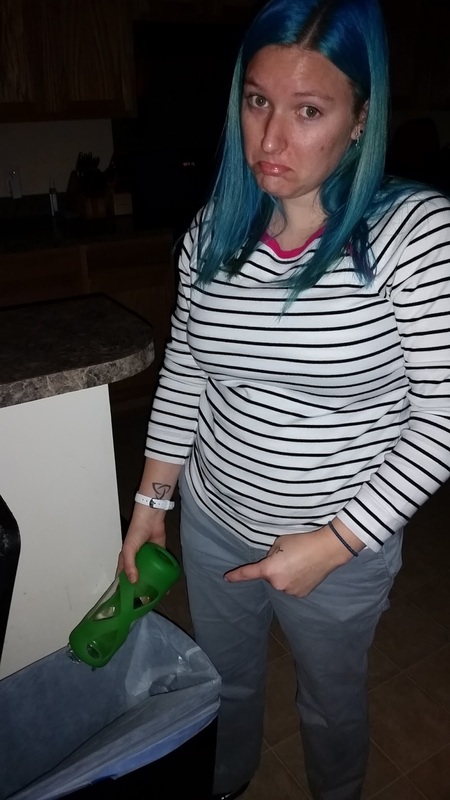 I am sad to report that I was trying to sling the water out of it one morning and I hit the lip just right on the side of the sink and the top of the bottle broke off. The glass bottle lasted maybe a month. I guess I should have known better than to buy glass to begin with, but whatevs. So now I'm down 2 Camelbaks and I have this thing about using a straw, it's kinda my jam, and my first Camelbak (which probably wasn't BPA free btw) lasted so long that I'm totally brand loyal now. I just went into Target (surprise) and purchased a replacement. Honestly, it was difficult because I knew that I could get more color options online, but I needed a replacement fast. I really liked the idea of the bottle and lid matching, so I went with the purple lid, purple bottle. In true Teh Dad fashion, I couldn't get rid of my blue water bottle when it cracked in October. I even told Teh MD Roomies that I needed to have a ceremony for it when they suggested I just trash it. They did understand me taking photos with it for blog purposes. They were such great roomies! I miss them. First the glass one that I wasn't super attached to. Then with much hesitation and sadness, I tossed my very faithful, abused, blue Camelbak in the trash. I'm not gonna lie, seeing the purple confuses me sometimes, as does using the new bite valve. Nonetheless, at least my bottle fits in Yurtle's cup holder again! Siiigh, here's to new beginnings and letting go of the things that always treated you right. I do the same thing. I bought a car once (Maddie) but once I got her paid off I started thinking stupid thoughts like making a newer car. I traded her in, and then missed her so bad I almost went back and bought her again. My ex husband had to stop me. I was a little obsessed with my Camelbak in college. Now I use the little tumbler cups with straws for work (fits easier in my cupholder & lunchbox) but still use my Camelbaks for workouts/road trips. And yes, it's very important to have a WATER ONLY bottle/cup.